A few nights ago, I had a craving for something sweet suddenly. I told Ralph about it and he bought me a packet of dried sweet guava peel and dried sweet lemon peel. While he and his friend busy playing on his PS2, I was busy munching the guava and lemon peels, alone. Yummy! I thought that was it. The next day, I came across some candy which Ralph left in this bag. The candy looks good and yummy. I ate one and then I had another one. There were two more of it left and I was trying to control myself from eating them knowing that he still did not know about it. It is not that he is stingy or what but I would not want to eat all of it without him around me. That candy tasted so good and I was eager to find out more about it. 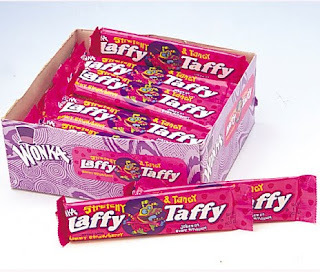 It says wonka laffy taffy candy on its wrapper. Each piece of taffy is bite size and still has a joke on every wrapper. How cool is that! I love the Strawberry laffy taffy flavor and the cherry flavor. They are simply irresistible. The quality of this candy is truly amazing. I wondered why he did not tell me about it and hid them in his bag. Or maybe he forgot to tell me. When he came back from work, I purposely kept the secret to myself and suddenly he took the bag and handed me the two more wonka laffy taffy candy. He did not realize it and he forgot to give them to me the day before. Actually one of his students who just came back from the US gave him a few but he hadn't tried any of them yet! I looked at him, with my innocent look and a pair of puppy eyes I told him that I ate two of the wonka laffy taffy earlier on when I found them in his bag. He just smiled and took one of them and gave the other one to me. I was so happy because he is just as sweet as the wonka laffy taffy! I haven done my taffy post yet! Recent blog:=- Yvonne Foong Needs Our Help! I ate cadbury chocolate! :) Anyway Good morning Mon!